Box contains 10 soluble sachets, for use in a spray bottle. 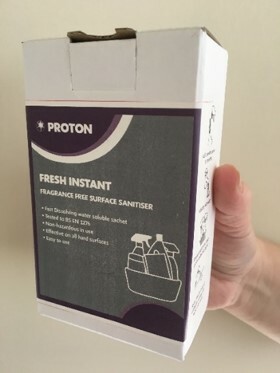 Place one sanitiser sachet into a spray bottle and add cold water, shake gently to dissolve sachet (takes less than a minute) and lasts for 1 month. Easy to use, non-hazardous in use and effective on all hard surfaces. 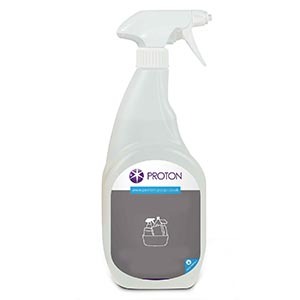 Can be used with our Trigger Spray Bottle. Offers Space Saving and safer handling as unclassified in sachet form. Box contains 10 soluble sachets, for use in a spray bottle. Place one sanitiser sachet into a spray bottle and add cold water, shake gently to dissolve sachet. Once Dissolved (taking less than a minute) the mix is active for 1 month. Easy to use, non-hazardous in use and effective on all hard surfaces.